Ask people what they used to aspire to growing up, and they might share dreams of stardom or athletic recognition, often set in the US. Elie Nour, on the other hand, would likely offer a slightly less glamorous vision of the American dream. It may sound simple, but sometimes it’s the simplest visions that present themselves most clearly, and thus exert the strongest pull. Nour spent years on the chase, fueled by a drive instilled in him by his parents. Finally, in 2005, he officially joined the business. With his dream turned real, one might think that his story had happily ended. But for Nour, it was the start of a new journey – one of exploration and education. It turned out that his earlier visions of the industry, seen through the lens of Hollywood and the protective glass of formal education, had been just a rough view. Actually being immersed in it was more challenging – as wealth advisors in general can attest to. The typical notion of the rewards for investment professionals would involve fees and commissions. While those must certainly factor in, Nour finds his reward not from external incentives, but from the fulfillment of proving his worth as an advisor. Of course, the world keeps moving onward and upward. The high-quality service of today will become par for course tomorrow, and obsolete the day after that. Currently, the terrain of the investment industry seems to be shifting into a more client-centred orientation. 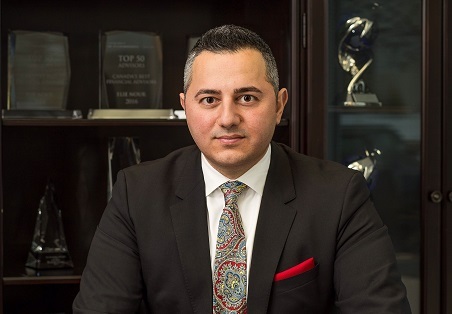 “In the last five years, a number of advisors have begun shifting their business away from the traditional transactional platform towards a fee-based platform,” Nour said. “It is my prediction that in another five years, advisors will continue to shift their business towards a managed account trading platform. The only constant thing, in the investment industry as well as the world, is change. Some might be content with waiting and handling challenges as they come, but Nour believes in a more active approach.